Okay here is the problem, upper pond has settled and is leaking out the top when we run the water fall (pump). Former homeowner built the thing and it is all mortared (sp) together. These are preform pools. Contemplating filling the whole thing in with dirt and planting it up. Or does anyone know a way to seal it up without taking it apart? Suggestions please. I love it, love the frogs and the fish and would like to keep it. Help! If you know where the actual leak is you could try using waterfall sealent to seal the leak. It's an expanding foam type of thing. Not sure that is the proper name I know it's waterfall something. If you ask at a pond shop they'll know what you are talking about. You just squirt it in the cracks and wa la it's plugged. I will try to find info for you. Also, What about the stuff they use to fix fiberglass tubs/showers etc. when they crack? That would be available at Lowe's or Home Depot. Or, what about Bondo like they use on cars. That stuff sticks to anything if the surface is roughed up enough, and you can make a patch with the metal screening like you use on drywall to patch holes. Rough up the plastic, use the mesh stuff, then cover the entire thing with bondo. Let dry. Then it's paintable to any color you would want and it shouldn't leak. I'm wondering if there is access to the affected area from the bottom level of the pond since the top seems to be really stuck together. If so, one of those options may work for you. Has any links above helped you? My thought was get a liner and put it inside the side that is not leveled and bring it up and out and level and support that, with cinders under it or bricks depending on how unleveled it has become, leaving more footage in case more settling occurs next year or so. Cover the liner. I think that may help I don't see the problem but it seems by what I understand it would be a quick fix just a few $$.You would have to hold the liner inside the pond and wall it up. That will take a little challenge but I believe it can be done. Thanks for the links gang! We have done alot of reading and research. We have decided to knock down the tower and remove the upper pond all together. 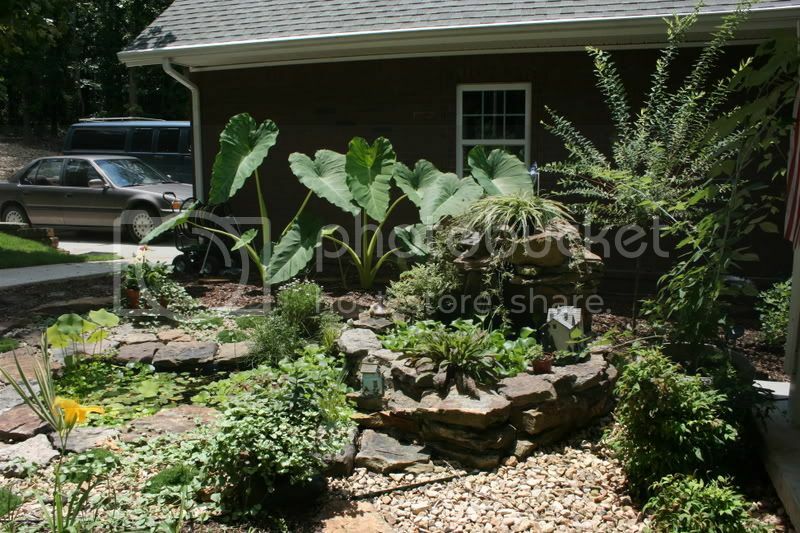 We ordered the rock this weekend and are going to do a dry stack waterfall into the large lower pond. After the froggies started singing this spring, I just couldn't part with the pond. We have our work cut out for us but in the end I think it will be worth it. I will post pictures of our progress. Demolition begins this weekend!!! Demolition has begun! The "tower" is off and we have the small pond almost extracted. Have totally changed plan for the umteenth time! We have decided to get rid of the tub ponds all together and do a liner with dry stack falls. Have pictures of the progress so far and will get them posted this weekend. I have all my plants and fishes in two giant styrofoam coolers. LOL! Hope to get it all back in place by the end of the weekend provided we don't have anymore major storms! Night before last we had the stacked birdhouse blown right out of the ground and tossed across the yard and my flowers were beat to all get out by hail. I am so done with rain right now! New Pond was finished just weeks before hubby had a heart attack. He now calls it the heart attack waiting to happen ;-). Anywho...here it is. Good heavens I hope your husband is okay. The pictures are a little small but from what I can see it looks great. Can you post a bigger picture so we can see the details. Looks great. But whao about the heart attack. Was it induced by the pond project? I hope he is doing better now, I know it can take sometime to recover. You are in our prayers.